Fans walk outside University of Phoenix Stadium on January 25, 2015 in Glendale, Arizona. Similar to many Wall Streeters who receive performance-based bonus compensation, NFL players who make it into the postseason are rewarded with bonus checks as part of postseason shares that the NFL distributes. Each season, the NFL sets a predetermined amount to compensate players based on how far their team goes in the playoffs. The bonuses kick in with the wild card and divisional playoff games and grow incrementally as players fight for the ultimate prize, the Vince Lombardi trophy. As the Patriots and Seahawks gear up for America's biggest game of the year in Super Bowl XLIX at University of Phoenix Stadium in Arizona, each player on the losing team's 53-man roster is guaranteed a bonus check of $49,000 just for being there. For the winning the team, the prize is a little sweeter, with a payout this year of $97,000, according to the 2014 NFL Media Guide. That means the journey from divisional leaders to Super Bowl champions pays out a total of $165,000 this year, a 5.1 percent increase from last season. With the average salary on the New England Patriots and Seattle Seahawks at $2.1 million, and the median salary at approximately $765,000, the bonus has different significance depending on the player. "It makes a lot more difference, financially, for guys making minimal league salary of $420,000," said Joel Correy, a former sports agent who helped found Premiere Sports and Entertainment. "The bonuses help, but it's nothing like the '60s and '70s, when players depended on these bonuses," says Joe Favorito, Sports Marketing Consultant and professor at Columbia University. 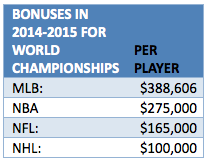 For players who made the 2015 Pro Bowl team, there is even more money to be earned. Both the Patriots and Seahawks had five players each selected for the Pro Bowl. Despite not playing in the game as they prepare for the Super Bowl, they will still take half of their Pro Bowl share just for being selected, according to Correy. The winning team earns $55,000 for the Pro Bowl, which is more than the losing Super Bowl team will make. 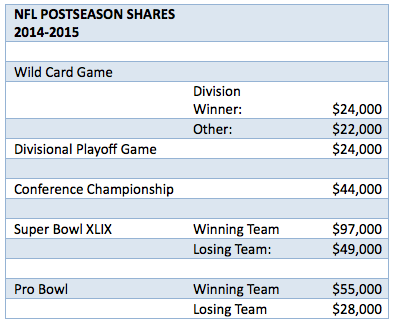 So how does the NFL's postseason pay compare to other sports? The world champion San Francisco Giants earned postseason shares of $388,606 this year for their third World Series in just five seasons. Major League Baseball's money comes from teams' gate receipts, while in football, the postseason shares comes directly from a league pool. In the NBA, the champion San Antonio Spurs earned $275,000 per player—66 percent more than what the Super Bowl XLIX winners will make—after they defeated Lebron James' Miami Heat. In hockey, the Los Angeles Kings' second Stanley Cup Victory earned them a team bonus of $3.75 million that was split up among the team, giving each player in excess of $100,000, according to Sportsnet. In the NFL, with 111.5 million fans tuning into Super Bowl XLIX, the biggest payoff may come in the form of exposure. For stars such as quarterbacks Russell Wilson and Tom Brady, it could mean millions in added revenue in the form of sponsorships, according to Favorito. For lesser-known players, Favorito expects that the exposure for playing in the Super Bowl translates in the thousands-of-dollars range. "It's an added bonus for players," says Corry. "It doesn't even factor into most players' thinking," he said. Disclosure: CNBC's sister company NBC Sports broadcasts the Super Bowl.